Each year the mathematics department at the University of Southern California invites a top mathematician for the Whiteman Memorial Lecture. 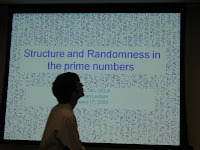 This year Terence Tao will be giving two talks: On the structure of prime numbers, and on compression sensing. I'm looking forward to both talks and an opportunity to hear Terry speak as I have never in the past. You can find the information about the talk at this link. The talks are scheduled for February 17th and 19th. I had an amazing time listening to a conversation between Danny Hillis and Robert Thurman on science and Buddhism, and how one can address ethical issues within either context. The conversation was scheduled for February 12th at 8:00 pm at the Skirball Center, which is off of Sepulveda Blvd (northbound). The place was completely packed. Robert Thurman was very witty, insightful, courageous, bold, and not to mention highly knowledgeable on Tibetan Buddhist philosophy. Danny Hillis talked about the scientific method, the ability of science to predict natural phenomenon, and man's ability to reproduce experimental results at different times, and at different places with similar results. The evening started out with Robert Thurman talking about the three tenets of Buddhism: The Buddha (Master/Teacher), The Ratnas (teachings), and the Sanga (community). Danny Hillis drew an immediate parallel with science where one may think of the master or Buddha being Nature, and we learn and observe her, and finally write papers on some subject where they get reviewed by the scientific community. They touched upon various topics such as reincarnation, consciousness, ethics, and living in the moment to what Robert Thurman called, "the long-now." Toward the end they opened up the floor for some questions from the audience. I asked both of them about the nature of time. 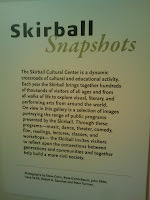 I highly recommend checking out some of the other program at Skirball. This talk was scheduled in honor of Charles Darwin's 200th birthday celebration. I believe they have another talk lined up. Check their calendar to make sure!